Following much debate, the Localism Bill became an Act of Parliament on the 15th November after both the House of Commons and House of Lords agreed amendments to the text of the Bill. The Localism Act is now an Act of Law, of which neighbourhood planning is a key component. On the following pages you can find out how CamdenCEN has been working with two very different communities in Camden to test the neighbourhood planning concept and prepare a Camden Blueprint for Neighbourhood Planning. We hosted our first Neighbourhood Planning event with residents of Somers Town on the 30 September at Somers Town Community Centre. As part of our Camden Blueprint project we were keen to explore how the neighbourhood planning process would work in the area. 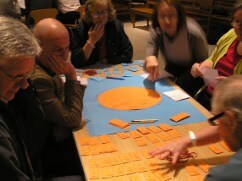 Similarly as in Bloomsbury, the aim was to define neighbourhood boundaries, identify local priorities and debate the type of forum that should lead a planning project; but this time there was a strong focus on engaging people who are under-represented or do not usually take part in community activities (including young people, older people and people from BME communities) through targeted workshops. You can find out all about the event in Somers Town, our Camden Blueprint Project and Neighbourhood Planning on our website. In response to interest generated by our Localism seminar in March we have started to explore how neighbourhood planning could work in Camden. We began working with Bloomsbury Neighbourhood Association and Bury Place residents in June to develop a planning project. On July 19th we facilitated a planning event for local residents and businesses at St Georges Church, Bloomsbury. The event was used to debate and define neighbourhood boundaries, the type of group needed to lead a planning process, and set up a local skills and resources bank. The event report is now available to download. Through providing independent support and facilitation to two very different neighbourhoods we hope to learn how neighbourhood planning can work in the borough. We aim to develop a Camden Blueprint by the end of December 2011, and share the learning with other communities and with borough planners. From September you will find updates on this website, in Voluntary Matters and in VAC's weekly email bulletins. In the Governments agenda for Localism, changes to the planning system are expected to give communities greater power and ownership over policies and plans that affect their local area by allowing people to develop their own local plans. 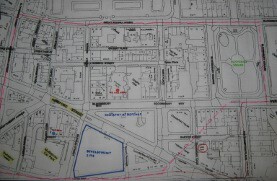 This has been termed 'Neighbourhood Planning'. Through providing independent support and facilitation to two very different neighbourhood's we hope to learn how neighbourhood planning can work in the borough. We aim to develop a Camden Blueprint by the end of December 2011, and share the learning with other communities and with borough planners. From September you will find updates on this website, in Voluntary Matters and in VAC's weekly email bulletins. In May, the Government unveiled new plans to make it easier to donate time and resources to charity. This CamdenCEN briefing looks at each of these new measures in more detail, including new developments for the support of infra-structure organisations. On Friday 25th March, CamdenCEN hosted a seminar at the New Horizon Youth Centre with key-speakers from Camden Council and the Voluntary and Community Sector (VCS). The aim was to raise understanding and awareness about the Localism Bill, hear different perspectives on the proposals, and discuss points of interest including the opportunities, and challenges it presents. A report from the event is available to download. Please see the 'meetings' page for more information. CamdenCEN recently wrote an article to be published in the spring edition of Voluntary Matters (the newsletter of Voluntary Action Camden). The article takes a much closer look at the Localism Bill and the likely challenges and opportunities it presents. This seminar illustrates some of the impact of the current economic and policy climate on the voluntary and community sector in Camden . 18 groups and organisations took part in a seminar where they built case studies about their groups or organisations and the people they work with or support. The participants represented different aspects of the voluntary and community sector including small un-funded groups supporting tenants and residents or specific communities, small and medium sized enterprises, and larger charities and service providers. How are you managing this? How do you think things will look in the future? The resulting case studies were redistributed and participants were invited to comment on these � to find connections and common ground, and to suggest other ideas and solutions. The findings of this seminar were compiled into a report which was widely-circulated throughout Camden. The report can be downloaded below. On the 13th December 2010, the Localism Bill was presented to parliament for its first reading. This CamdenCEN briefing looks at the four main aspects of the Bill. During December 2010 Camden Community Empowerment Network hosted a seminar and meetings, received email and verbal feedback, and gathered views from VCS members of strategic partnerships and groups in the borough on a future vision for LSP. The following paper has been put together using feedback from voluntary and community sector (VCS) organisations. Recently published, the new national Compact agreements sets out the shared principles and guidelines for the government to work in partnership with the voluntary and community sector. Download the latest publications below, or visit the Compact page for more information on the Camden Compact. In October the CamdenCEN Executive Board were asked to elect four representatives from the CamdenCEN Executive to represent the Voluntary and Community Sector at the Local Strategic Partnership. The elected Chair and Vice-Chair take up two of the four available places and the remaining two places are filled by electing two further members of the Executive. It has been the practice to elect representatives from both front line and infrastructure (2nd tier) organistaions to ensure a balance from across the sector. The seminar focused on some of the general themes of the review. Council officers participated in the second half of the seminar to discuss points that had been raised. Relationship between the council and the voluntary and community sector � what's the whole picture? Sorting out the funding stuff � commissioning, procurement, grants, rent grants, asset transfer, full cost recovery, mixed economy��..
What makes a strong and sustainable sector and how can the council support this? What should a framework for the relationship between the council and the sector look like? The introductory presentation slides as well as full notes from the seminar are available to download. There were also a number of suggestions and requests from organisations requiring further information and seminars. Camden CEN are responding to these requests through future events and briefings. To kick-off, on November 5th we are holding a seminar called 'Introduction to Building Consortia and Partnerships'. A recent open letter written by Francis Maude (Minister for the Cabinet Office) and Nick Hurdy (Minister for Civil Society), asks voluntary, community and social enterprise groups for their ideas on how to help reduce the deficit. Your concerns, ideas for savings, and examples of best practice can be posted on the Cabinet Office Website or emailed directly to the Office for Civil Society. Click here to find out more. What are Local Councilors Proposals to Improve Life in the Capital? London Councils is inviting councilors from across London to put forward their suggestions and ideas for improving life in the capital. The proposals are now available to read online on the London Councils' website. All councilors are welcome to contribute and can comment on published proposals online. The Government is committed to ensuring that third sector organisations are not subject to unnecessary or disproportionate regulation and administrative burdens. The new law and regulation pages will be regularly updated to highlight the latest developments in cutting red tape for third sector organisations to help them to keep up with changes that help them. The focus on volunteering in relation to employment has produced a number of advances in policy, practice and institutional relationships. A Bit Rich: Calculating the real value to society of different professions. In this report NEF calculate the value to society of a number of different jobs and advocates a fundamental rethink of how the value of work is recognized and rewarded. CamdenCEN has produced a number of factsheets around the LSP, Community Strategy and other strategic structures. You can download them from the Briefings and Factsheets page. The Voluntary and Community Sector can use Public Law to challenge the bad behavior of public bodies - such as the council or PCT - and propose better working practices that are fair to you and your service users. By the end of the session you will have ideas of what remedies are open to you and how to go about getting a fair decision!